I love macaroni. I enjoy it with white sauce, red sauce and also when it is prepared with Indian spices. 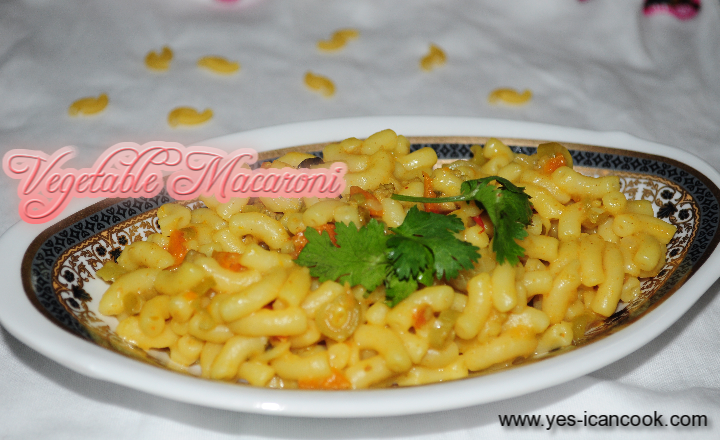 This macaroni recipe is prepared using vegetables with Indian spices. I eat an extra serving when this is made. Did you know that Macaroni is pasta that is elbow shaped. 1. In a cooking vessel heat oil. 2. Add onions and cook till they turn translucent. 3. Add the chopped vegetables and mix well. I used just carrots and green beans. You can use green peas, capsicum, corn, cabbage etc. You can also add mutton mince or chicken mince or even eggs. 4. Add ginger garlic paste and mix well. 5. Add the turmeric powder, chilli powder, salt and coriander powder and mix well. 6. Add tomato and mix well. 7. Add coriander leaves and mix. 8. Add some water and let the vegetables cook for 5 minutes. 9. In a separate vessel bring water to a boil. Add some salt and a 2 Teaspoons of cooking oil. When water boils vigorously add the macaroni and cook to desired tenderness. Drain the water and keep the macaroni aside. 10. When the vegetables are cooked and the water has totally evaporated add the cooked macaroni and mix well to combine the vegetables with the macaroni. 11. Cover and cook on low flame for 5-10 minutes till steam is formed.